WLU, UW and Conestoga college will be contributing to the Studio Project (Graphic by Steph Truong). Governance discussions are currently in the works to determine how local post-secondary institutions will operate within a new digital arts hub that was approved by Kitchener city council last month. Conestoga College will be the lead tenant for the Kitchener Studio Project, located at 44 Gaukel St. in Kitchener, with involvement from both the University of Waterloo (UW) and Wilfrid Laurier University (WLU). “A good way of understanding the Kitchener Studio Project as it’s been explained so far is that the Kitchener Studio space will be for arts and [digital media] content what the Communitech Hub is for technology,” explained Shawna Reibling, the knowledge mobilization officer for the Office of Research Services at WLU. The Kitchener building, formerly a post office, will be leased by Conestoga College. 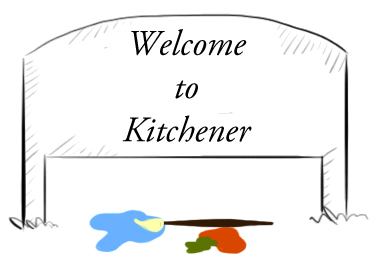 The city of Kitchener has contributed $200,000 to renovations required at the site and partners on the Project will absorb the remaining costs. According to Reibling, the space will contain equipment such as a computer lab with digital editing capabilities and sound recording facilities. While the space is directed toward students and faculty, partnerships have also emerged with the Communitech Hub and visual technologies company Christie Digital. “We’ve been supportive of doing the project for the capacity that it’ll provide the Region and the opportunities that it’ll provide for the students. What’s especially attractive about this facility is that we have different schools collaborating together in the same space,” expressed Charles Fraresso, senior manager of research and innovation at Christie Digital. Fraresso explained that they would be involved through working on projects with the students and potentially organizing competitions. For the city of Kitchener, the Project contributes to the goal of building up the city’s technological industry and capacity, in particular by advancing the digital media sector. “One of the key clusters that we’re looking at for the municipality for economic development is digital media. That cluster we see there’s enormous potential for growth. With all of the development that’s happening within the core of downtown Kitchener, we really want to enhance that level of digital media for keeping that talent in the community,” said Ioannidis. Although no official date has been determined, Ioannidis estimated September as a potential launch date.